Honorable Mention -- 2006 Hobby Builders Supply "Creatin' Contest"
Suze and her friend Linda enjoy collaborating on elaborate miniatures. 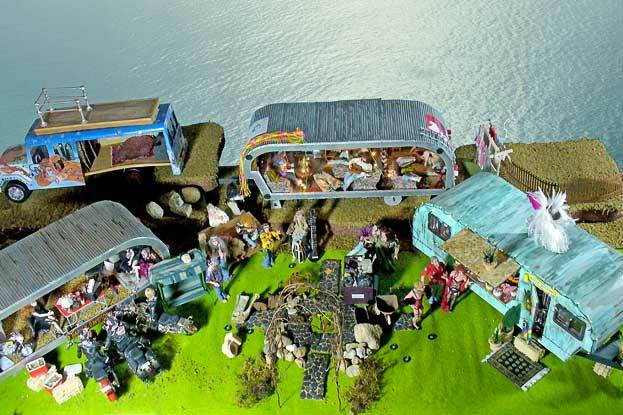 Suze had purchased 3 trailer kits, and decided that she and Linda should create "Saturday night at Hell-Haven Trailer Park", in honor of Tom's birthday (Tom being a friend of theirs and a trailer park owner). They wanted their trailer park to be different, kind of a "last-stop" place. The themes for the 3 trailers emerged as they thought it through. Of course Tom's had to have a birthday theme, so they created a blow-out birthday party in his trailer. Cakes, presents and outrageous party decorations fill his copper-patina covered home. Mirrored balls, feather boas and champagne glasses all add to the atmosphere of a birthday party fit for a queen. Suze wanted her trailer to represent the bikers and Road Angels who ride Harley Davidson motorcycles. A pair of discarded leopard pajamas were sacrificed to create the leopard wallpaper and curtains, and an old pair of leather pants became the chair upholstery, pants, boots, chaps and pillows. A laundry hamper was cut up to create the curtain separating the toilet from the rest of the trailer. Found fabric scraps were used to fashion other pillows, as well as the underwear for the trailer girls. Linda's trailer is a throwback to the '60s. These are hippies who started out for Woodstock but never made it. Each poster that decorates the walls of the trailer is from an actual rock concert given during the "Summer of Love" way back in 1965-67. The trailer is decorated like a room Linda had during those days. The beaded curtain was made from an old lampshade trim. The young hippies had been made nearly 20 years ago by Ellen Poitras and stored in a box, waiting for this creation. Ellen also made the 60 year old hippies who now seem to represent the parents of the younger dolls. The miniature tabla and sitar are from India.